If you’re going to invest the time and money in knitting yourself a sweater, you want to love the finished product and love how it looks on you, right? Something I’ve learned over the course of knitting ~20 sweaters is which styles look flattering on me and the styles I’m most likely to actually wear. Some of that has been good ol’ trial and error and the rest has been little tid bits I’ve picked up from other knitters via Ravelry, blogs, and knitting books. Before choosing a sweater for the KAL, take a look in your closet. Pull out your favorite store bought (or handknit if you’ve knit sweaters before!) sweaters and tops. Is there a style of top that you gravitate towards? A particular cut that makes you feel like a million bucks? If you aren’t sure which styles flatter you the most, Amy Herzog has put together a fantastic series of blog posts called Fit to Flatter (scroll down to the bottom and start with Installment 1). There’s also a Fit to Flatter Ravelry Group to answer any additional questions and see her tutorials in action. She covers everything from determining your body shape to how to choose and adapt knitting patterns to flatter your shape. It’s well worth a read-through even if you’re a seasoned sweater knitter. If trying to nail down a pattern choice weren’t enough, you’ll also need to find a yarn that will work well with the pattern. Lucky for you, we’ve taken a good hard look at Hannah’s patterns and made a handy dandy spread sheet pairing up patterns and yarn available at the shop! We’ll have a copy of this as the shop as well, so we Stash Enhancers can help you choose the perfect yarn! 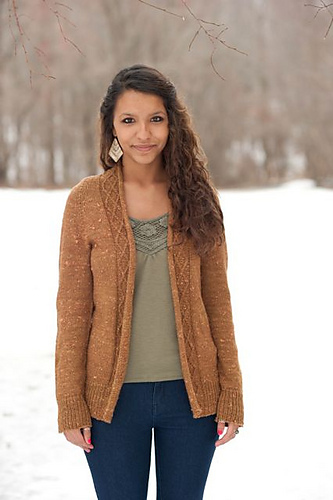 Hannah Fettig has a number of other designs that aren’t on the spreadsheet, mostly from old issues of Interweave and KnitScene magazines. Of course, we’d be happy to use our special yarn choosing powers to help you pick a great yarn for those patterns, too! 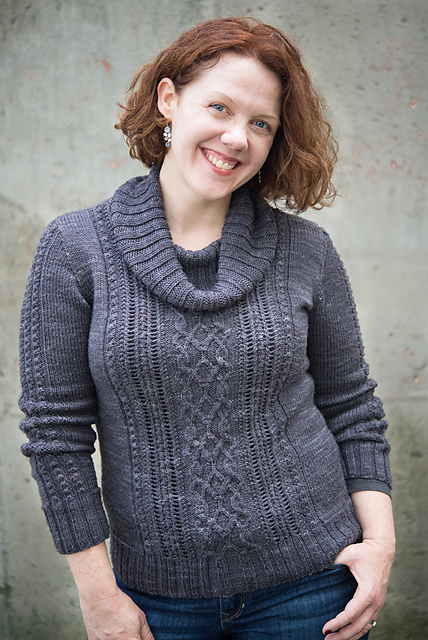 Of course, these blog posts are supposed to help you with future sweater knitting, too! One of the first things I do when I’m trying to decide which yarn to use for a sweater pattern is to head over to the pattern page on Ravelry. Once I’ve found the pattern page, I click on the “projects” tab and browse through the finished projects and take note of the yarn substitutions that other knitters have used and how the sweaters look in various yarns. Ravelry is a fantastic resource to use when trying to substitute yarns for any type of project. You can also look up the yarn in the Ravelry database and take a look through the different types of projects made with that specific yarn. 1. What are the details of the yarn used in the pattern? Fiber content? Yardage? Gauge? Single ply or multiple plies? 2. Take a look at the stitch pattern in the sweater. Will you want a crisp yarn with good stitch definition? Is the sweater structured or drapey? 3. Will you be wearing something underneath your sweater? Or does the yarn need to be “next-to-skin” soft? 4. Be realistic about the durability of the yarn. Does the yarn look like it will resist pilling? 5. If there are cables, lace, or some other kind of textured pattern consider your color choices carefully. You don’t want to lose the beautiful details of the sweater by knitting in a color that will hide the reason you picked that pattern in the first place! If you’d like to delve further into this subject, The Knitter’s Book of Yarn by Clara Parkes is a wonderful resource. Little Red in the City by Ysolda Teague also has a small section devoted to choosing yarns for sweater knitting. On Wednesday, we’ll talk about swatching for your sweater! I know, I know…every knitter’s least favorite thing. But I’ll tell you why I think it’s incredibly important in the sweater knitting process. Stay Tuned, Knitters!